This project is a hit amongst my fifth graders. It stresses symmetry and introduces a new technique- metal tooling (repousse). Fold the typing paper in half, either vertically or horizontally. 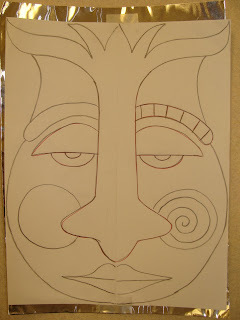 Draw a face, using large shapes that fill the paper. 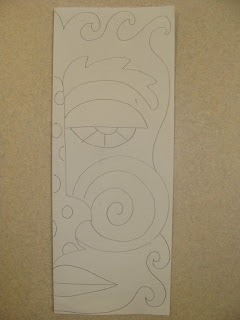 I tell the students to begin with the nose shape and move toward the edge of the paper. It is important to fill the paper so not much metal is wasted. Patterns should be added to parts of the face as well. 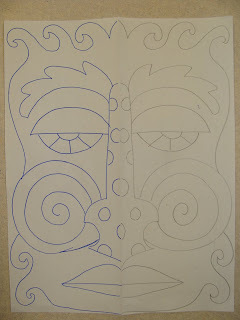 Using a light box or window, flip the paper over and trace the other side of the face, making it symmetrical. Tape the drawing to a sheet of metal, place it on a stack of newspaper (used as a cushion), and trace the drawing using a ball point pen. This will transfer the drawing to the metal. Remove the drawing and use the repousse tool to pop some of the face shapes out, being careful not to break through the metal. Use permanent markers to add color to the faces, making sure to keep them symmetrical. Cut out the mask shape using regular scissors. Recycle the aluminum scraps. Tape the mask to the stand using clear packing tape- I have used masking tape and it falls apart within a few weeks. To make the stands: drill a 1/4" hole in the middle of the base and use wood glue to add the dowel to the hole. Our custodian makes these of scraps from the high school wood shop class. Punch 5 holes on each side of the mask along the bottom edge. Add ribbons: fold the ribbon in half, push the loop through the hole, pass the tails of the ribbon through the loops, and gently pull tight. Note: ribbon colors should be symmetrical. String a variety of beads on to each ribbon. We used 5 beads plus one "brake" pony bead tied at the bottom to keep the beads on the ribbon. Note: bead choices should be symmetrical! They are beautiful. How expensive were they to make? Stunning - Have been told if you purchase very strong alumina foil for cooking- glue two layers together you will be able to get a similar result at a cheaper cost. Worth experimenting if not you have heaps for covering collograph prints. I haven't tried your method, Cheryl, but it sounds interesting! DellaRae, I haven't actually done a price breakdown, but the aluminum isn't too expensive- $7 a roll, I think. I buy the ribbon when it goes on sale for 4/$1 a JoAnn Fabrics. I think the biggest expense would be the beads because I love buying all kinds to use. The Sharpies are used all year long, so it isn't just an expense for this project. Thank you so much for this post! These masks are so dynamic and beautiful. Your directions are very clear. Can't wait to try this! I have worked with this material and the edges can be quite sharp when cut...any injuries? Love the project! 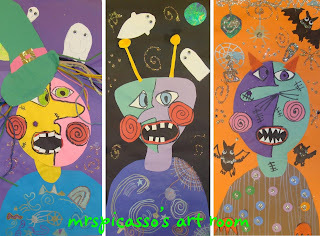 Nancy, I have done this project with fifth grade for several years with no injuries as of yet!